A week since my last post and I am still feeling stable. I’m beginning to answer, “How are you?” by saying that I am well, or even good. I still do it with a slight sense of trepidation. Is this hubris? Am I fooling myself? Is there some hidden power out there after all, waiting until I think I am well before striking me with a bolt of psychosis or rapid cycling? Of course the next thing people want to know is: why? Or maybe how or perhaps what has brought this thing about about. And I wish I knew, I really do because then I could write it down as a prescription for wellness and then I never need be desperate again. I was thinking about all the things that have been recommended to me over the years or that I had read about or learned about in a class as being helpful for “recovery” (I”m going to keep putting that word in quotes, because I don’t believe that it is a helpful thing for me to aspire to or label my progress). I decided to put a fun spin on things and make a word cloud just to see the scope of advice I’ve received over four and a half years. Many things I have tried already to no avail. Some are just – no. Not going there (especially not seeing my bipolar as a genetic advantage). Many seem sensible and at least unlikely to do harm but at the same time appear too minor to have significant impact. Amusingly, the cloud has split up a phrases and created odd juxtapositions like “oily faith”, “low walnuts watch” and “sugar advantage”. I don’t know, maybe some of those could be more useful than a number of the suggestions I have encountered in my life. You could point to many of those words and ask if it is something that’s helped me. Has mindfulness helped? Yes. Somewhat. What about spending time with friends? Of course. Routine? Yes. Singing? Definitely. Being out in nature? Yes. Yes! Yes, but…I did these things six months ago, a year ago, and they did not have the same effect. I’m on the same mediation I’ve been on for six months. There is no magic lever that has been pulled, drawing up a curtain to show a happier scene. Also, there are a whole bunch of chicken/egg scenarios in the mix. Right now I am taking more exercise than I have in a while. Lots of walking, where possible within London’s leafy spaces. I’m doing cardio at home and I’m just about to take up yoga again. But do I feel better because I am exercising more, or am I able to exercise more because I’m more stable? Similarly, I’ve improved my diet adding lots more fruit and veg and reducing sugar intake. That ought to make me feel well I suppose, but at the same time there is no way I would be able to keep to this if I were unwell, desperately craving fat and sugar. However it has occurred, I am being to have more and more of a life worth living. Work has picked up and I am revelling in freelance writing, in ensuring expert patient input into health strategy, in going out into the field as a service user researcher. In my spare time I am starting to undertake activities that I think of as nourishment. When I am very unwell it’s impossible to “feed” myself with rich life experiences; all I can do is grab at whatever scant snatches of emotional food that I can find. Even when things are improved it is often too much to do anything that feels like it’s doing psychological good unless Tom’s with me, guiding me through. Now I feel able to take charge of life-affirming experiences. Lunch with a dear friend. A solo walk in an early autumn park. Taking myself off to a restored Edwardian cinema where the afternoon showing is almost empty and I can relax on velvet seats, a glass of wine in hand. Going to a gallery on my own (last week I adored “Wanderlust“, the Royal Academy’s Joseph Cornell exhibition). These things are like taking on superfoods which are both delicious and full of the nutrients I need to develop my wellness and enrich my life. So I don’t know what’s going on underneath my mood, but if it’s a combination of medication, exercise and improved diet then I’m very loathe to change any of that. Sometimes I grumble about the diet and exercise bit because I’m not really losing weight – but then I remind myself that whatever I am doing is obviously helping (and will be good for blood pressure and reduce the risk of metabolic syndrome, something I worry about as I have been on a high dose of atypical antipsychotics for years now). In other words, I don’t want to rock the boat. If something appears to be helping, I’m going to carry on doing it. Now is not the time to follow the original plan to taking the lamotrigine to the max and gradually withdrawing the quetiapine; I plan to stick them both as well as lithium, pregabilin and thyroid augmentation. Now is not the time to go back to comfort eating because winter is coming up and I am grumpy and cold. The thing that bothers me is that for a long I have been waiting for therapy. Specialist CBT was recommended when I first saw the specialist affective disorders people in November, alongside the aforementioned drug regime, and for most of this year I have been pushing for therapy. At one stage I felt that we were just pushing the combination of meds up to higher and higher doses without any real benefit and I felt that therapy would be a better way of addressing my problems. Only now I have the option of starting therapy and I no longer know what to do with this. Part of me feels too late, too late; where was it when I needed it? Part of the problem is that I have grave reservations about the therapist, because after all that waiting we really, really didn’t click at the assessment and I left feeling devastated. I also have grave reservations about the therapy as I had forgotten until I was given mood monitoring charts that actually I really dislike CBT. Six months ago I would have grabbed onto the offer like a person down a well offered a stepladder to the surface, regardless of the treatment, regardless of the worker. But now? Now I don’t want to rock the boat. I don’t want to add anything into the complex and only little-understood system that is making me well. And therapy, any therapy, upsets things, brings difficult stuff out into the light. And I don’t want to do difficult stuff. I can barely bring myself to think about how awful the first half of this year was, let along look at past horrors. And those are the issues with therapy per se, never mind the therapist issue and the fact that it’s CBT. But this is all that’s on offer. I’ve asked to work with another therapist on the team and there is none. I could be letting a vital opportunity go. And I know that there is an argument that you have to be well enough to do therapy, but I don’t think I’m as well as all that that just yet. 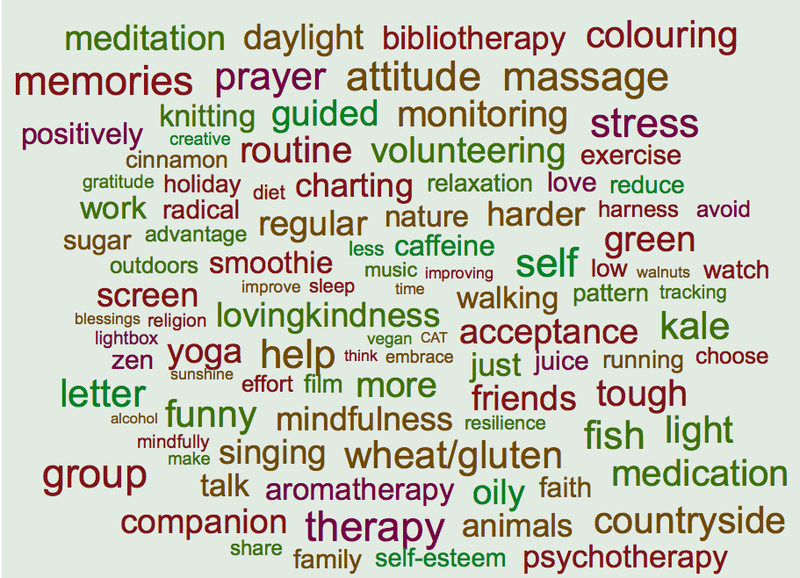 This entry was posted in Bipolar, CBT, Cognitive Behavioural Therapy, exercise, Medication, Mental health services, Mood disorder, NHS services, Recovery, Therapy and tagged Bipolar, Cognitive behavioral therapy, Employment, exercise, Medication, Mental health medication, Mindfulness, Psychotropic medication, Recovery, Therapy, walking, Wellness, Wordcloud. Bookmark the permalink. 8 Responses to Don’t rock the boat! “Well described!. I too dislike labels, the word “recovery” being among the top 10. In my “Handy Guide for the Every Day Warrior” principle #2 comes to mind. “The past is always changing.” CBT is about rethinking the past, but the benefit comes from doing stuff that reshapes the past. Action from thinking will continue to strengthen those emotional muscles. Who needs to spend time with someone who makes them feel devastated? Well I am currently doing 6 yoga classes a week! But I don’t think I am hypomanic at all because I am not obsessing about it. There’s no OMG I MUST GET TO CLASS DON’T GET IN MY WAY! Just, ooh, what class do I have today I’m looking forward to that… Only you can say what is normal for you and what isn’t. It might be helpful to keep a diary of what’s going on for you, so you can spot the moment you start to move into hypomania. I am able to do this now, but it’s taken a LOT of work. I have had CBT on two occasions and each time I disliked the experience as I hated dragging up the past. I told my therapist on the second occasion how I felt and that I didn’t want to do CBT again. That was 10 years ago. I am delighted to learn that you are managing so well on your own at present. You truly give me so much inspiration and support whenever I catch up with your blog. I too have not changed my medication for 10 years now and I definitely do not wish to rock the boat. I still have good and bad times and both vary in length depending on what is going on around me. I am alone with my adorable dog for many hours a day. The loneliness is horrid but it has to be this way because of the enormous debt I have caused my husband in previous years. We are still hurting from the damage after losing our family home and now we live hand to mouth. My husband is truly wonderful and now that I am stable some of the time he is so grateful for the good times. I know I wouldn’t manage life without him as he has stuck by me throughout the very bad times and we love each other so very much. Just before I finish I have started to read other books after you introduced us to Linda Gask’s The Other Side Of Silence which I would recommend to anyone with bipolar. I have read An Unquiet Mind by Kay Redfield Jamison which as far as I am concerned is another brilliant read. Now my husband and I are reading a book together which is Loving Someone with Bipolar Disorder by Julie A Fast and John D Preston,PsyD. So far so helpful. Anyway Charlotte all the very best to you and keep doing what you are doing as it is working. My love and hugs. Being diagnosed with Bipolar Disorder less than a year ago. I found a therapist online through a psychology site….I read their bios and looked at their pictures. I picked the one that resonated with me based on their writing. I feel that I was so LUCKY we clicked! I gave her permission to push me to talk about things that I really don’t want to because it will help me get better and I can’t bring myself on my own to bring up things and work through them. I think that if I didn’t make that connection with her I wouldn’t be doing therapy I would have just quit. I am lucky that she is willing to do tele-therapy with me as I moved across the country from her. I agree with you on the don’t mess with what’s working. Yeah there can be a plan to adjust meds in the future but it doesn’t have to happen RIGHT NOW! That’s me too right now…I really really want to taper off my seroquel NOW but I know that it will happen eventually!